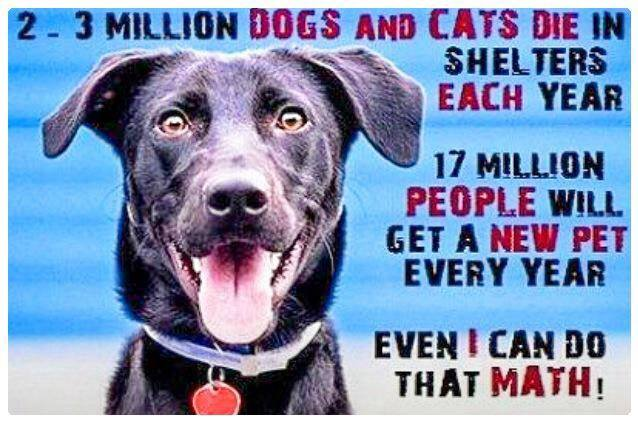 Every dog or cat not purchased from a pet store or backyard breeder improves the pet over population problem created by irresponsibility & greed. There are plenty of animals to choose from at most shelters. They come in every age, shape, size, coat color, & breed mix, and you can find purebreds at shelters as well. In fact, many breeds have their own rescue organizations, so if you’re looking for a purebred, make sure to check both your local shelter & breed rescue organization. Compared to the cost of purchasing a pet, adopting one from an animal shelter is relatively inexpensive. And if you get a slightly older dog or cat, there’s a good chance he is already fully vaccinated & neutered. Adopting a mature dog or cat also takes the guesswork out of determining what your pet will look like as an adult – what size she’ll grow to, the thickness & color of her coat & her basic temperament, for example. Most shelters & rescue organizations do assessments on every new pet taken in, to determine things like temperament, whether the pet has any aversion to other pets or people, whether he is housebroken, has had obedience training, etc. Many of these organizations also have resources to help pets with lack of training or behavioral issues. So when you adopt a pet from one of these organizations, you have a pretty good idea what to expect from your new dog or cat when you bring him home. Many shelters & rescues also provide lots of new owner support in the form of materials about training, common behavior problems, nutrition, basic grooming, & general care. In some cases there are even free hotlines you can call for questions on behavior, training, & other concerns. If you have kids, & especially if the new pet will be cared for by a child, adopting a shelter animal can open a young person’s eyes to the plight of homeless pets. It can also help him learn compassion & responsibility, as well as how wonderful it feels to provide a forever home to a pet that might otherwise live life in a cage, or be euthanized. An older adoptive pet can be the perfect companion for an older person. Many middle-aged & senior dogs and cats require less physical exertion & attention than younger animals. An adopted pet can enrich your life in ways both big and small. The unconditional love & loyalty of a dog/cat/animal can lift depression, ease loneliness, lower blood pressure, & give you a reason to get up in the morning. A kitty asleep in your lap feels warm & comforting. A dog that loves to walk or run outdoors can be just the incentive you need to start exercising regularly. There are countless benefits to pet ownership, & when you know you saved your furry companion from an unpleasant fate, it makes the bond you share that much more meaningful. Thank you Dr. Becker for these great reasons for adopting & not shopping. We have two dogs rescued from shelters, and they are the most loving “people” I know. They are our companions, our jesters, and even our therapists–seriously. Whenever my kids come home from a rough day at school, the pups just instinctively sense it, and they curl up with the kids until everyone is happy again.